Ninth and tenth grade students participated in the Freshman Impact: Caught in the Moment on October 2nd at Wheatland High School. 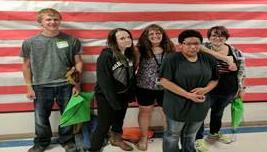 The day was packed with a series of short workshops in which the students learned consequences that could happen to them if they participate in risky behaviors, such as drinking alcohol, taking drugs, driving under the influence, or attempting suicide. They also had a workshop about what it really means to have healthy relationships with other people. In the WHS drama club with the help of first responders and other community officials showed the audience a possible scenario when people do not heed the warnings given that day. They started with the bad decision, followed by the wreck, the funeral, and then the court proceedings. Although the day was very intense for the students, they all thought it was a good learning experience and wished all the high school students could have participated.